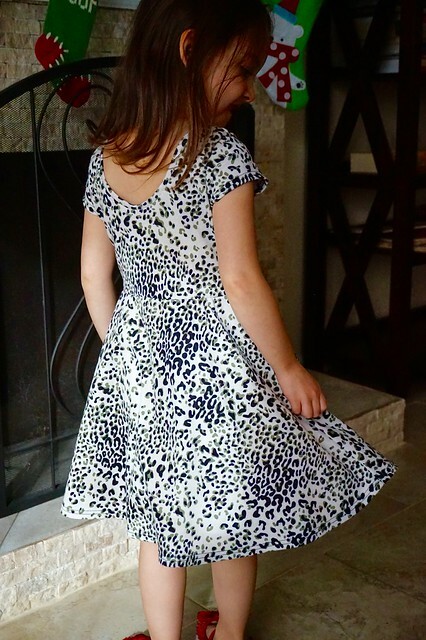 This pattern is a knit dress/top with many options, including a half circle skirt, gathered skirt, and peplum top versions in sizes 2 through 12. There are several sleeve and neckline options which makes this pattern worth every cent in my opinion, and they’re so easy to put together! The pattern instructions are very clear and easy to understand, and it’s rated for an adventurous beginner. She also lets you know which pages to print for the different sizes which is always convenient. My first test version was a long sleeve dress with round front and back scoop necklines and a half circle skirt in a size 4. I chose a thin jersey knit fabric from the red bin area of JoAnn’s. It’s bright melon with navy blue butterflies, and I think the stretch was about 75%. The dress came together very easily since I had already made a few for myself. 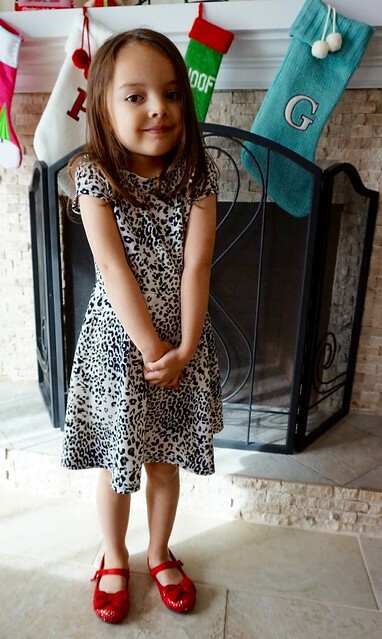 She absolutely loves wearing this dress because it’s twirly of course, but it’s very comfortable for her to run around in and look like a cutie pie! The fit is spot on too. My next version had long sleeves, round necklines, and a gathered skirt in a size 4. I used a cotton jersey rayon spandex from Girl Charlee. 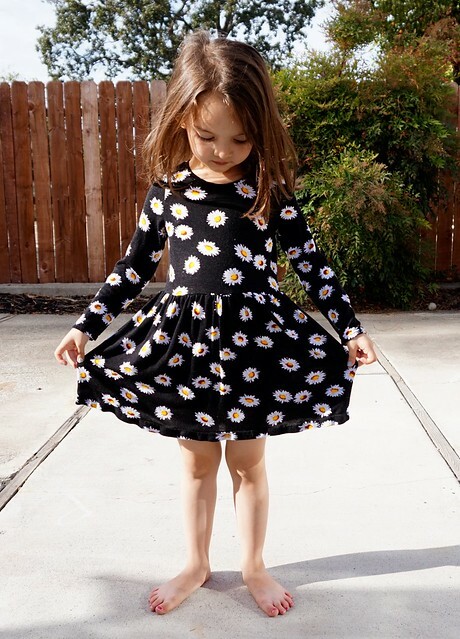 My daughter loved the daisies, but the fabric is very light weight. I debated on lining it but decided against it since I was just testing the pattern. I’m not crazy about this fabric for this dress, as it just kind of hangs there. I also decided to try out using stitch witchery for the bottom hem for the first time. I’ve read things like it gives you a crisp hem, makes it much easier, blah blah blah. I’ve decided it’s not for me. After washing, it gives the hemline a strangely “fake” appearance that just doesn’t go away, and my daughter likes to stretch it which makes the stitch witchery “tear”. I think I’ll stick with clips to hold my hems together, or you know, my favorite wonder tape! My next version was a 3/4 length sleeve, half circle skirt dress, with round back and front scoop necklines in a size 4. I used a double knit fabric I had in my stash, again from JoAnn’s. It’s sweater like, soft, and a bit warmer for the cooler weather. I didn’t have enough to match the front dots, so I was actually not even going to make this one, but in the end, I needed to pattern test all the versions, so I did. I’m glad I did though because it’s on the cover of the pattern! How cool is that?! On this pattern test I did feel the front scoop was a bit low. I tested the front scoop in the size 2 as well, and felt it was low too. 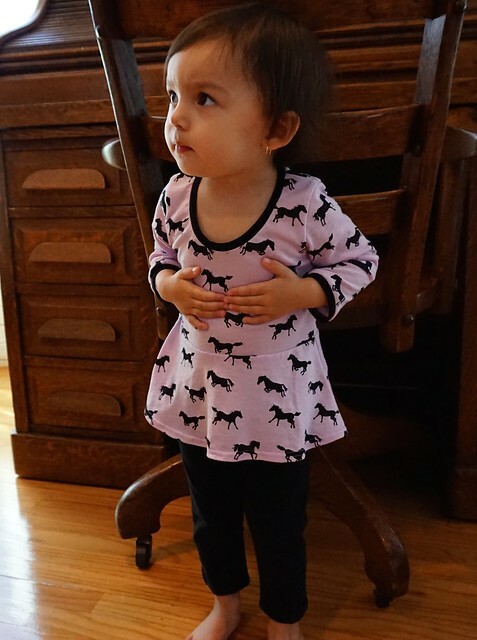 I made the long sleeve peplum version in a modal cotton rayon blend from Girl Charlee. 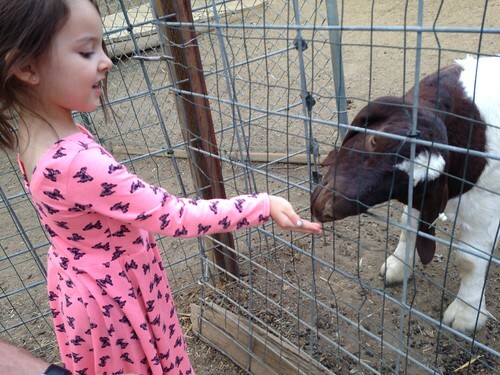 It’s Horse Play on lilac, and another light weight fabric. I decided to use black ribbed knit for the neckline binding and sleeve binding, although the sleeve binding was my own change to the pattern. I absolutely love the peplum version! I didn’t get many pics, but I’m definitely making more! I then tested the short sleeve, half circle skirt version with round front and scoop back necklines in a 4. This time I used a ponte de roma from Girl Charlee called Small Black Sage Leopard on Cream. It fit her perfectly! I made this for a wedding, and it didn’t disappoint! 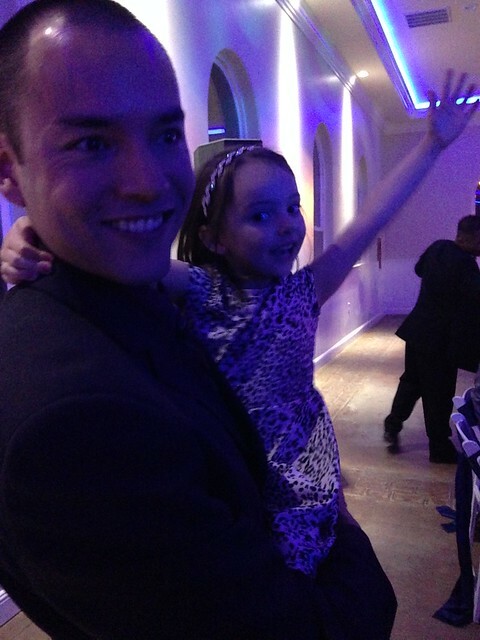 Here she’s posing with her daddy, and she had a blast at her first wedding. She had so many compliments on her special dress, and I had just put it together the morning before the wedding and had time to wash it too! I just love that back scoop neckline! The movement of the skirt is lovely and fluid in this fabric too. So then of course I had to test out yet another version, and make some pjs using the peplum top in size 4! I used a waffle knit I had in my stash, and the Go To Leggings pattern (baby size is free) for the bottoms. I used a yellow rib knit from Girl Charlee for the bands and cuffs. Of course she LOVES this version, and come on, pjs! I did have to shorten the bodice length because I was running out of fabric, so I lengthened the peplum a little. Ok, I can’t tell you how versatile this pattern is…ok maybe I did, but wait until you see some of my pattern hacks! 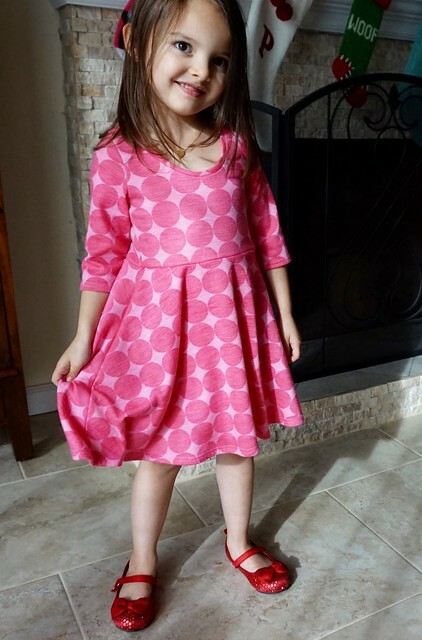 I made a matching Astoria for my little gal using the Little Miss Ruby Tuesday pattern, and it was sooooo easy! Coming soon! 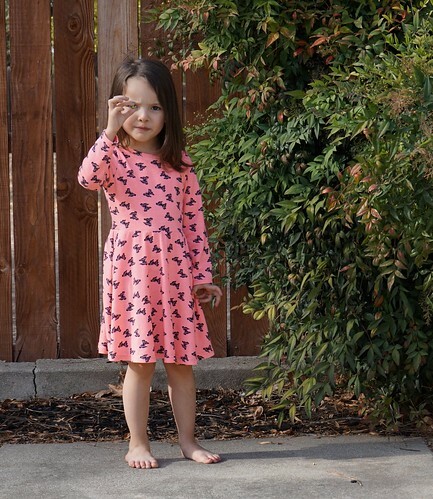 As I’m writing this, the Little Miss Ruby Tuesday dress pattern is on sale. Don’t forget to check it out, take a peek at my gal on the cover (heehee!). There’s also a pattern bundle with both the girls’ version and the ladies’ dress version, you know, if you want to get both and be matchy matchy too, or is that too cheesy? Oh who cares, it’s fun!